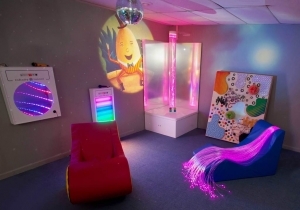 Complete Multi Sensory Environment able to meet a variety of sensory needs for a variety of diagnoses. This room includes the Big 3; Bubble Tube, Fiber Optics and Projector. By adding positioning pieces like the red/yellow Jr Therapy Chair and blue Relaxer you are able to instantly set a relaxing mood to the room. The sound sensitive pieces, Infinity Tunnel (left on wall) and Ladder Lights (behind red Jr Therapy Chair) provide an opportunity to control the environment as well as see what your voice can do. Tactile is also important and our Textured Wall provides 15 different textures to explore.